Recipe provided by Chef Crusco Catering in Austin, TX. Place potatoes into large pot of salted water. Boil until soft (about 15-20 min’s). While warm, pass through a vegetable mill or ricer and onto a clean, floured counter top. Let cool so that the egg won’t cook when incorporated. When ready, make a well in center of potatoes & sprinkle all over with flour, using most of the flour. 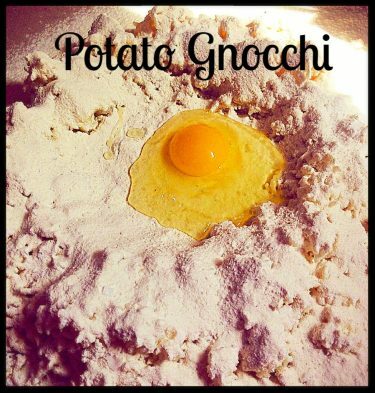 Place eggs & salt in center of well & using a fork, stir into flour and potatoes, just like making pasta. Once egg are mixed in, bring dough together kneading gently until a ball is formed. If dough is too sticky add some more flour. Knead a few minutes until ball is dry to touch – it should be moist & billowy when ready. Let dough rest for 5-10 minutes. Cut dough into 2 separate pieces. Then cut each into 8 smaller portions. Gently roll each 1/8th of dough into a snake-shaped log, the thickness of your thumb. It takes time to master but with patience you can make it work. Be sure to work from the middle and out. Once in a long rod use a knife to cut pieces every 3/4-inch. Dust with a bit more flour so that each gnocchi doesn’t stick. To shape, either use a fork or a gnocchi dowel . Hold the handle or fork in one hand and place a gnocchi pillow against the ridges of the handle or tines of the fork, and roll down and out – SOFTLY, SMOOTHLY AND IN 1 MOTION! It should curl into a slight “C” shape. The back will capture the impression of the tiny ridges (good for catching sauce later). Set each gnocchi aside ensuring they are spaced apart from each other and dust with a bit more flour if needed, until you are ready to boil them. Place a new large pot of water to boil and cook the gnocchi’s in batches by dropping them into the boiling water roughly 20-30 at a time. They will let you know when they are cooked because they will pop up to the surface. Fish them out of the water a few at a time with a slotted spoon. Have a large, warmed platter ready with some of the sauce you’ll be serving. Place them in the platter and continue cooking in batches until they are all done. Gently toss with more sauce but don’t overdo it as it should be a light dressing. Serve immediately, family-style with a drizzle of good extra virgin olive oil on top and a good dusting of the king of cheeses – Parmigiano-Reggiano. Enjoy!